The first section of nearly 10,000 new seats were recently installed at the Los Angeles Memorial Coliseum. Eight temporary press boxes are also being erected to host members of the press. (Emily Smith/Daily Trojan). The Los Angeles Memorial Coliseum has been collecting history since its opening in the summer of 1923. It was constructed as a living memorial for the U.S. Armed Forces in World War I, and it immediately became home to USC football. While it has never wavered as a sacred place for Trojans fans, the Coliseum has hosted many other sports teams throughout the years including the UCLA Bruins (1933-1981), the Los Angeles Rams (1946-1979, 2016-2019), and even temporarily the Los Angeles Dodgers (1958-1961). It has also served as a concert venue for some great rock legends such as The Rolling Stones, Bruce Springsteen and Prince. While it is viewed as a piece of L.A.’s athletic history, the stadium has also been host to political leaders like Martin Luther King Jr., Nelson Mandela and Cesar Chavez. Its versatility has always prevailed, from hosting Pope John Paul II’s Papal Mass in 1987, to setting the Guinness World Record for highest number of fans in attendance at a baseball game for a Dodgers vs. Red Sox match in 2008. And soon enough, it will go down in history as the only venue to have hosted three Summer Olympics — in 1932, 1984 and 2028, respectively. 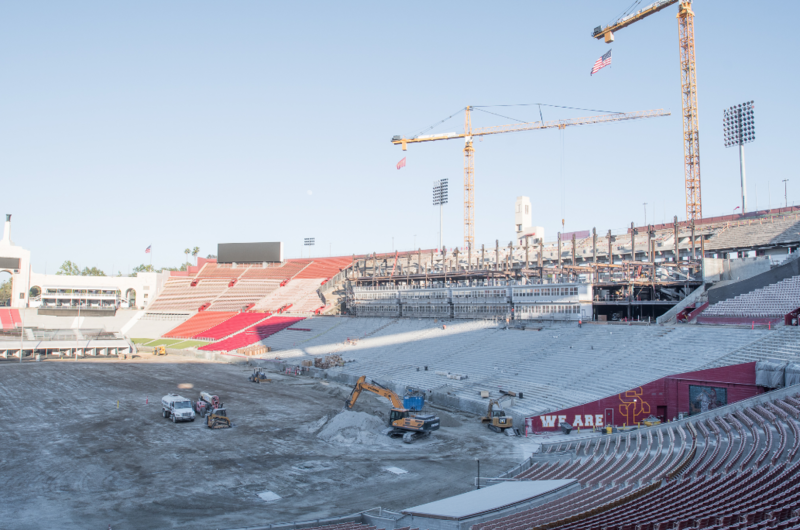 Now, the Los Angeles Memorial Coliseum is on its way to becoming the United Airlines Memorial Coliseum, which is scheduled for completion by Fall 2019. Despite these major renovations, the Coliseum has multiple seen changes in its 95-year history. Players used to enter through the 50-yard line tunnel until 1949, when it eventually got covered up. In 1993, the stadium underwent a notably smaller renovation, where all bleachers were replaced with individual seats. The Coliseum’s current renovation includes the installation of more handrails throughout seating areas, as well as the replacement of every seat to increase legroom and seat width. Beyond new seating arrangements, USC is upgrading the stadium’s electrical and plumbing systems and improving Wi-Fi access in the venue. The preservation of the Coliseum’s history remains a top priority during the renovation. USC is looking to restore the peristyle end to make it closer to its original construction, leaving the iconic torch and Olympic rings. The jerseys displaying the Trojans’ Heisman winners will also remain in place. The renovated Coliseum will boast two new screens on the east end of the stadium to complement the 6,000-foot high-definition screen over the players’ tunnel, which was added in 2011. It will be complete with upgraded audio technology and new lighting, as well as luxury suites and club seats on the south side. The University is currently in the process of installing temporary press boxes to ensure its availability for the 2018 football season. Luckily for USC students, the student and band sections will remain where they have been. They remain a top priority so as not to compromise the experience for the home team.